I saw Daft Bat at B&N not long ago and picked it up thinking it would make a cute Halloween read aloud for the kids at school. Tony Ross’s illustrations are very free and rough around the edges, which helps with the “daft” idea-nothing looks too tidy. 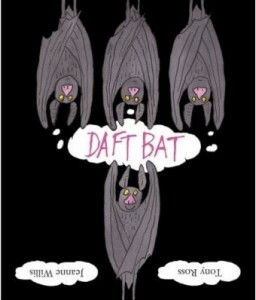 It’s actually just a great story about accepting differences (and you get to teach kids the word “daft”). It was just released here in the US, but it looks like it was released in Australia and the UK two years ago. A little bat arrives and all the wild animals think she’s crazy. Because in her world, the sky is below her and the grass is above her. But a wise owl steps in to teach all the animals to see things from someone else’s point of view. Soon all the animals realize that the bat isn’t crazy at all, she just sees things upside down. It’s not a Halloween story at all, although it’s an excellent read aloud if you’re looking for another tie-in around this time of year.